Find artworks, auction results, sale prices and pictures of Constantin Brancusi at auctions worldwide. Constantin Brancusi (1876-1957) La jeune fille sophistiquée (Portrait de Nancy Cunard) signed, dated and inscribed \‘C Brancusi 1928 1932 PARIS PAR\’ (on the underside of the bronze) polished bronze with artist's carved marble base Height (overall): 31 ½ in. (80 cm.) Height (without base): 21 ¾ in. (55.1 cm.) Conceived in 1928 and cast in 1932; unique Provenance Acquired from the artist by the family of the present owner, 1955. CONSTANTIN BRÂNCUȘI (1876–1957) Princesse X, 1916 gelatin silver print, mounted on card blindstamped photographer's credit (mount, recto) image/sheet: 8 7/8 x 6 3/4 in. (22.5 x 17.2 cm.) mount: 18 1/2 x 15 in. (47 x 38 cm.) Provenance Acquired from the artist by Agnes Ernst Meyer (1887–1970); by descent to Elizabeth Meyer Lorentz (1914–2001); gifted by the above, 1996. 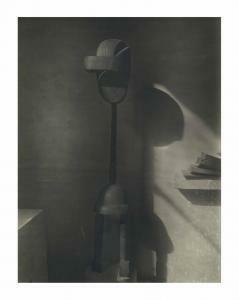 Literature Friedrich Teja Bach, Brancusi: Photo Reflection, Didier Imbert Fine Art, Paris, 1991, pl. 45, p. 85 (dated c. 1918). Exhibition catalogue, Constantin Brancusi: 1876-1957, Philadelphia Museum of Art, Philadelphia, 1995, fig. 1, p. 140. Lot Notes The present photograph was donated to the Museum by Elizabeth Meyer Lorentz (1914–2001), the second daughter of Agnes Ernst Meyer (1887–1970). As a journalist in New York, the young Meyer met Stieglitz, Steichen and other artists within their circle; it was through this connection that she first met Brâncuși while on a trip to France in 1908, establishing what became a lifelong friendship. After her marriage to Eugene Meyer, Jr., a wealthy financier, she found herself in the position to collect the work of various significant artists of the time, including Paul Cézanne, John Marin, and Brâncuși. º Please see Section K of our Conditions of Sale for definitions of cataloguing symbols. Constantin Brancusi (1867-1957) La muse endormie signed 'Brancusi' (on the back of the neck); stamped with foundry mark 'C. VALSUANI CIRE PERDUE' (on the side of the neck) patinated bronze with gold leaf Length: 10 ½ in. (26.7 cm.) Original marble version carved in 1909-1910; this bronze version cast by 1913 This work is sold with a certificate of authenticity from Dr. Friedrich Teja Bach dated 21 February, 1999. \\\“With this form, I could move the universe.\\\” So Brancusi declared, with few words but immense confidence, of the long sequence of ovoid sculptures–utterly radiant in their formal purity–which would come to define his sublime and inimitable visual poetry. At a time when cubism, all fragmentation and disfiguration, was on the ascendant, Brancusi forged his own intensely personal modernist path, his and his alone, turning to the elemental, immutable form of the primal egg as his initial inspiration and master key. \\\“He achieved a new vision of nature, rooted in its own deep, mysterious laws,\\\” Carola Giedion-Welcker has written. \\\“The volume seemed to emerge serenely from its own universe, in perfect harmony with the possibilities of the material\\\” (Constantin Brancusi, New York, 1959, p. 14). La muse endormie is the first in Brancusi\\\’s series of egg-shaped sculptures, its formal and expressive perfection marking the inception of his mature work. The form of a sleeping woman\\\’s head has been distilled into an almost perfect oval, the purity of outline marked only by subtle, attenuated allusions to the physical features of the model. The hair is indicated with parallel incisions that culminate in a small bun on the back of the head; the arched bridge of the nose stands out in relief, reaching down to the delicate incision of the mouth. The head tilts and lifts ever so slightly at the forehead, and to an even lesser degree at the chin, as if afloat from the incorporeality of dreaming. Faint bulges demarcate the eyes, evoking the internal and imaginary vision of sleep, and an expression of serene reverie overlies the whole. \\\“La muse endormie of 1909-1910 constitutes a decisive break in Brancusi\\\’s oeuvre,\\\” Giedion-Welcker has declared. \\\“Here one feels for the first time that the psychological emanation of his work has completely changed. Gentle relaxation and deep absorption, a spiritual repose-in-oneself, are its dominating figures. It is as though we were looking at the dreamlike smile of Buddha. Bare and stripped of all verbiage, the primal oval form...embodies a mysterious inner growing: it is the force of developing life, expanding from every side, out of dream-laden sleep\\\” (ibid., pp. 14 and 21). The act of creation in all its many manifestations is embodied in the exquisitely refined and deceptively simple forms of this sculpture. The sightless, internalized gaze evokes the process of artistic creation, timeless and enigmatic. The pristine oval of the head, at once utterly still and pulsing with incipient life, suggests the ovum, where an entire being and its universe exist in an embryonic state, as well as the metaphorical cosmic egg, the mythic beginning of the world. The complex inwardness of sleep, expressed in the sculpture\\\’s partially effaced eyes, offers a metaphor for the interiority of the egg. \\\“Brancusi\\\’s sculpture is a return to the primeval element, the primary molecule, the germ of all life,\\\” Barbu Brezianu has written (\\\“Brancusi: An Artist in Quest of the Absolute,\\\” UNESCO Courier, October 1976, p. 21). Brancusi was in his early thirties when he conceived this breakthrough sculpture; he had arrived in Paris from his native Romania in 1904 at the age of twenty-eight, according to legend walking almost the entire way. In short order, he obtained entrance to the École des Beaux-Arts and a job washing dishes to pay the bills. His early work from Paris was heavily influenced by Rodin, and in March 1907 he secured a position as a pointing technician in Rodin\\\’s studio, transferring the master\\\’s compositions from clay into stone. He left after only a month, though, famously proclaiming, \\\“Nothing grows under big trees\\\” (quoted in Brancusi, exh. cat., Philadelphia Museum of Art, 1995, p. 39). By that time, Brancusi had already begun to search in earnest for an alternative to Rodin\\\’s well-trodden path. He prowled the halls of the Louvre, the Trocadéro, and the Musée Guimet, immersing himself the archaic art of Egypt, Assyria, Iberia, and East Asia. In the fall of 1906, he visited the Gauguin retrospective at the Salon d\\\’Automne, where the hieratic, audaciously anti-classical figures that Gauguin had carved in Polynesia struck him with the force of a revelation. By the end of the following year, Brancusi too had cast aside the lessons of his long academic training. Forsaking the refined, professional Western tradition of modeling and casting, he began to carve directly in wood and stone. It was his \\\“road to Damascus,\\\” he later declared with an almost religious fervor–his definitive turning point, like the apostle Paul\\\’s conversion. This modernist moment of origin–of rebirth and renewal–is boldly encapsulated in the spare, ovoid form of La muse endormie. 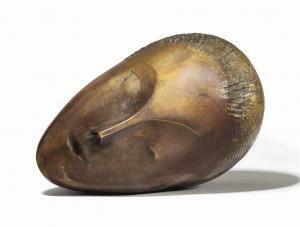 From his earliest years in Paris, Brancusi had been fascinated by the theme of sleep. Between 1906 and 1908, he sculpted several heads of sleeping women and children, all of which retain the descriptive naturalism that he had learned from Rodin. La muse endormie represents a clear break with these early experiments. The model was his friend Baroness Renée-Irana Frachon, whom he had depicted at least twice in 1908-1909–first in a relatively naturalistic clay sketch, then in an increasingly stylized and mask-like stone portrait, both now lost. The next time she posed, the Baroness later recalled, Brancusi \\\“asked me to sit down and to close my eyes, to keep my face still so that he could capture the expression of serenity one has in sleep\\\” (quoted in A. Chave, Constantin Brancusi: Shifting the Bases of Art, New Haven, 1993, p. 47). Brancusi now concentrated on the beauty of the head alone, treating it not as a fragment of the body but as an autonomous sculptural entity. Distancing himself from the individual model\\\’s distinctive physiognomy, he allowed purified form and spiritual discipline to triumph over mundane matter. \\\“Only the merest breath of an imprint manifests itself on the smooth surface,\\\” Giedion-Welcker has written. \\\“No physiognomic interest is expressed in the detail, and only a general atmosphere of austere gentleness seems to make itself felt, giving substance to the mythic note of a primal world dream\\\” (op. cit., 1959, p. 14). Only a subtle expression of inner vitality, barely apparent through the surface, evokes the original presence of the model–the sculptor\\\’s literal muse. Brancusi first carved La muse endormie in white marble in 1909-1910 (Hirshhorn Museum and Sculpture Garden, Washington, D.C.) and over the course of 1910 created three plasters and six bronze versions of the radiant, abstracted head. The present sculpture is one of only two bronzes from this sequence that remain in private hands. The Art Institute of Chicago and the Metropolitan Museum of Art in New York each have one, and the Musée National d\\\’Art Moderne in Paris houses the remaining pair. Recent technical examination of the present sculpture has confirmed that it was cast from the same plaster (now in the Atelier Brancusi at the Pompidou) as all five of the other bronzes; the plaster in turn was cast from the Hirshhorn marble. Brancusi considered each of these bronzes a unique work of art, not a part of a uniform edition. \\\“In a series based on a single theme or motif, no one bronze is identical to another or to the initial marble,\\\” Margit Rowell has noted. \\\“Between the original and each of its reprises, Brancusi introduced minute variations, not only in size, degree of asymmetry, and alloy composition, but also in finish and patination\\\” (op. cit., 1995, pp. 48 and 104). One of the Muse endormie bronzes in the Pompidou, for example, is polished to a mirror-like gloss, while the Chicago and New York examples combine gold leaf with a black patina on the ribbed hair, emphasizing the textural contrast. The present version is more matte in finish, with a warm tonality that Brancusi heightened by gilding the sculpture. The overall effect is closer to the soft, translucent surface of the marble, which gently catches the light to convey a sense of natural radiance, than to the industrial gleam of the more highly polished bronzes. Rather than entrusting the surface of his bronzes to a foundry or studio assistants, as Rodin did, Brancusi finished them himself, creating by this means a sequence of expressive variations on a single autonomous form. Friends and witnesses recall the sculptor\\\’s long, meditative sessions of polishing, over weeks and even months, as he worked to perfect his desired effects. \\\“An artist should always do his own chores,\\\” he insisted. \\\“A sculptor\\\’s toil is slow and solitary\\\” (quoted in op. cit., 1993, p. 210). Brancusi\\\’s intense, personal attention to the nuances of each individual work reflects his exceptional sensitivity to materials and commitment to traditional handicraft. \\\“Each material has a particular language that I do not set out to eliminate and replace with my own,\\\” he explained, \\\“but simply to make it express what I am thinking, what I am seeing, in its own language, that is its alone\\\” (ibid., p. 206). Brancusi first showed La muse endormie publicly in spring 1912, submitting the marble version to the annual Salon des Indépendants in Paris. Although cubism dominated the exhibition, Brancusi\\\’s work attracted welcome praise from Apollinaire, who typically reserved his fiercest advocacy for Picasso. \\\“A subtle and very personal sculptor,\\\” the poet wrote of Brancusi, \\\“whose works are among the most refined\\\” (quoted in op. cit., 1995, p. 374). During the same year, Brancusi also created an unexpected, wakeful counterpart to La muse endormie, setting the sleeping head upright on a fragmentary torso to produce a new sculpture entitled Une muse. The left cheek rests lightly against a raised palm in a posture at once introspective and alert; the neck is positioned at a pronounced angle to the head, lending the sculpture an element of precariousness that contrasts with the luminous, untroubled calm of the visage. No longer a nascent, quiescent being, the ovoid form has been incorporated into an image of evolved humanity, capable of cognition and creativity. By the time that Brancusi completed the upright Muse, preparations were well underway for one of the most important artistic events of the entire era–the now-legendary Armory Show, scheduled to open in New York in February 1913. 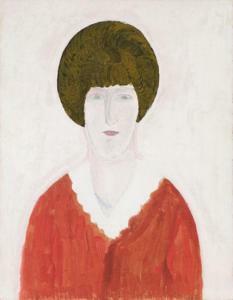 This sprawling and sensational exhibition was intended to introduce unsuspecting American audiences to the daring new directions in modernism that had been developing across the Atlantic in recent years, and the three organizers–the American painters Arthur Davies, Walter Pach, and Walt Kuhn–sought the best and most advanced art that they could find. When they entered Brancusi\\\’s studio in November 1912, in the midst of a whirlwind ten days in Paris, they knew immediately that they had come to the right place. \\\“That\\\’s the kind of man for whom I\\\’m giving the show,\\\” Davies memorably exclaimed (ibid., p. 50). They selected four of Brancusi\\\’s most innovative works for inclusion in the show: Le baiser, La muse endormie, Une muse, and Mademoiselle Pogany. As they were unable to insure the marbles or the bronzes, they arranged for plaster versions to be shipped to New York, along with a marble torso that Davies purchased from Brancusi for his own collection. The fearlessness of their choices paid off. Together with Duchamp and Matisse, Brancusi received more attention in the press than any other artist in the Armory Show–some of it predictably bewildered or derisive, but much of it unexpectedly awe-struck and admiring. Picasso and the cubists were largely eclipsed. \\\“I wholeheartedly applaud the incredible success of this exhibition,\\\” Brancusi wrote to Walter Pach after receiving news of his favorable reception, \\\“and I am happy that beauty is beginning to receive its due\\\” (ibid., p. 51). Within only a year, at least four versions of La muse endormie had already found buyers in America, where Brancusi–even as he lacked for patrons back home–would soon boast a devoted coterie of collectors. The plaster that was exhibited at the Armory Show caught the eye of Mary Harriman Rumsey, the young heiress to the Harriman railroad fortune (see Christie\\\’s New York, 14 May 2015, Lot 11 C). Arthur Davies purchased the marble Muse endormie and Alfred Stieglitz acquired one of the bronzes; another bronze went to Arthur Jerome Eddy, a New York lawyer who became a passionate advocate of European modernism in the wake of the Armory Show. Several casts of La muse endormie, however, remained in Brancusi\\\’s studio, where they inspired the sculptor to probe further the seemingly boundless possibilities of the elemental form. In 1917-1918, he created two new and increasingly abstract interpretations of the sleeping head, which he designated La muse endormie II and III. In both, the brows are expressed as an austere, geometric ridge, the chignon at the back of the head is reduced to a minimum, and the eyes have entirely melted away. \\\“The serial motifs that characterize Brancusi\\\’s work,\\\” Ann Temkin has written, \\\“prove his originality by testing it: the seeming repetitiveness of his sculptures only demonstrates more compellingly the individual distinction of each\\\” (ibid., p. 136). In Sculpture pour aveugles (1916) and Le commencement du monde (1920), Brancusi refined the ovoid form to its limit, obliterating the visage entirely and leaving only the memory of a human head, organic form at its simplest. \\\“The egg, shell and substance, is what is needed,\\\” he explained. \\\“Fullness and volume are necessary in order to give the shock of reality\\\”–that is to say, of life. Although contemporary critics made the occasional jibe at these radically reductive sculptures–\\\“Here\\\’s a sculptor who puts all his eggs in one basket,\\\” read one headline–the majority understood and admired Brancusi\\\’s radical aim. \\\“He has smashed all the old models; Venuses and Adonises have no meaning to him. Brancusi is so drastic that he goes back to the original first egg\\\” (quoted in op. cit., 1993, pp. 125 and 128). Provenance Jacques Ulmann, Paris (by February 1958). By descent from the above to the present owner. Saleroom Notice Please note that this work is stamped with foundry mark 'C. VALSUANI CIRE PERDUE' (on the side of the neck). Pre-Lot Text PROPERTY FROM A PRIVATE PARISIAN COLLECTION Unlike others of the Romanian sculptor\\\’s famous motifs, like L\\\’Oiseau dans l\\\’espace or La Colonne sans fin, the origin and sources of La Muse endormie are well known. It references the influence of Rodin–at whose workshop Brancusi first started carving directly into marble in spring 1907–and from whom he retained the art of the fragment–as well as the academic tradition of the sculpture portrait bust. The first \\\“muse\\\” in the strict sense of the term, was the baroness Renée Frachon who posed for him from 1908 to 1910. Following a number of preliminary studies modelled in clay, a first version carved in stone (now lost) was a \\\“portrait\\\” standing upright, with a stylised oval face in which the geometric nose and mouth are slightly asymmetric. The model\\\’s features reappear in the final marble of the first Muse endormie (1909-1910, The Hirshhorn Museum and Sculpture Garden, Washington, D.C.), but this time in a horizontal format, a reclining head with no shoulders and just the nape of the neck–like a revival of the theme developed with Le Sommeil (1908, Muzeul National de Arta al Romaniei, Bucharest), a face barely emerging from the marble, echoing Rodin. With La Muse endormie, we see the mingling of the material–the fragment from which Le Sommeil emerged - and the face derived from reality, whose vertical posture has once again fallen asleep within the stone. It was from the marble housed in Washington that Brancusi produced the six bronze casts currently identified, including the present work. It is taken from the original intermediate plaster, patinated with shellac and kept by the artist in his studio (after 1910, Musée national d\\\’art moderne, Brancusi bequest the 1957, Paris). The imperfections in the casting plaster can be seen in the bronze itself, partly patinated, polished and gilded with gold leaf, a practice Brancusi used from his first casts in polished bronze, including the Danaïde series of heads from 1913. The model\\\’s features are partially effaced–as they would increasingly be in the later versions–beginning the future transformation of a realistic portrait into a simplified object, the starkness of a pure oval stripped of any figurative reference. By losing any connection with the body, the face of the baroness moves towards the geometric although at the same time the surface itself was treated in a physical, even pictorial way, creating color variations and bronze reflections for the different areas: the forehead and cheeks left golden, the unpolished hair made darker by the grooved \\\“fluting\\\”. This is what Brancusi made clear in a letter sent on 15 June 1917 to John Quinn, purchaser of Une Muse, another variant of new vertical La Muse endormie: \\\“For the bronze patina I purposely left some parts ungilded for contrast.\\\” Beneath this surface, the half-closed eyes and the half-open mouth are perceptible; the only significant relief is the fine bridge of the nose emerging from the oval and defining the sloping contours curving along the eyebrows, beneath the hairline. The left eye, barely visible, seems to hint at what is going on inside, like a forthcoming flicker of an eyelid. This could suggest an alternative presentation of the work: turning the \\\“sleeping\\\” side of the face against the mount, as the sculptor advised his collector, John Quinn, in a letter dated 27 January 1919: \\\“When mounting these two marbles [Prométhée and La Muse endormie] it would be preferable to place [the first] on its right side and [the second] on its left side\\\”. Translated from the original French by Cabinet de la Hanse PROPERTY FROM A PRIVATE PARISIAN COLLECTION Literature R. Vitrac, \\\“Constantin Brancusi\\\” in Cahiers D\\\’Art, 1929, p. 383, no. 8-9 (plaster version illustrated). M.W. Brown, American Painting from the Armory Show to the Depression, Princeton, 1955, p. 46 (plaster version illustrated in situ). G. Habasque, \\\“L\\\’Armory Show\\\” in L\\\’Oeil, Paris, 1959, p. 17 (plaster version illustrated in situ). 1913 Armory Show 50th Anniversary Exhibition, 1963, exh. cat., Munson-Williams-Proctor Institute, Utica and Armory of the Sixty-Ninth Regiment, New York, 1963, p. 184, no. 617 (marble version illustrated, p. 41). S. Geist, Brancusi: The Sculpture and Drawings, New York, 1975, pp. 177-178, no. 72d (marble and another cast illustrated). 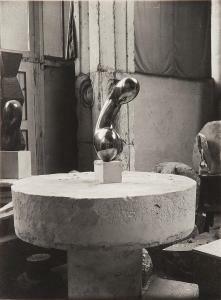 I. Jianou, Brancusi, Paris, 1982, p. 93 (another cast illustrated, fig. 25). F.T. Bach, Constantin Brancusi: Metamorphosen Plasticher Form, Cologne, 1987, pp. 430-431, no. 99 (marble and another cast illustrated, p. 430). M.W. Brown, The Story of the Armory Show, New York, 1988, p. 249, no. 617 (plaster version illustrated in situ). M. Dubin, Sleeping Beauty: The Secret of Brancusi\\\’s Janus Muse, The Mary Harriman Rumsey Collection, New York, 1989, pp. 24-25 (plaster version illustrated in situ). F.T. Bach, M. Rowell and A. Temkin, Constantin Brancusi, exh. cat., Centre Georges Pompidou, Paris, 1995, pp. 102-105 (marble, plaster and other casts illustrated, pp. 103-105). R. Varia, Brancusi, New York, 2002, pp. 114 and 116-119 (plaster and another cast illustrated in color). M.S. Kushner and K. Orcutt, eds., The Armory Show at 100: Modernism and Revolution, New York, 2013, p. 436 (plaster illustrated, p. 228, fig. 170 and illustrated in situ, p. 31, fig. 10; another cast illustrated in color, p. 371, fig. 289). Exhibited Paris, Galerie Claude Bernard, Sculpture, February 1958. Paris, Galerie Claude Bernard, Exposition Internationale de Sculpture, June-October 1959 (illustrated). Paris, Galerie Claude Bernard, Portraits-Sculptures, January 1967. Geneva, Musée d'Art et d'Histoire, 1998-1999 (on extended loan). Torino, Galleria d'Arte Moderna, Africa: capolavori da un continente, October 2003- February 2004, no. 5.4 (illustrated in color). Basel, Foundation Beyeler, Visual Encounters: Africa, Oceania, and Modern Art, January-May 2009 (illustrated in color). Basel, Foundation Beyeler, Constantin Brancusi and Richard Serra: A Handbook of Possibilities, May-August 2011, pp. 239 (illustrated, pp. 106-107).